Osteopath, Dr Michelle Funder says, "Chronic pain can affect people of all ages, races and genders and one in five GP consultations involves a patient suffering with chronic pain. "Australians suffering from chronic pain can often feel invisible or helpless as their diagnosis may not meet medical definitions of what constitutes an illness. This leaves the patient feeling at a loss for an explanation for their pain and therefore a management plan to help them. "Chronic pain patients can often fall through the cracks of the medical industry and have multiple doctors and practitioners telling them conflicting advice," says Dr Funder. President of Osteopathy Australia, Dr Bill Adamson says, "An osteopath can form a diagnosis and prognosis to help someone feel better. If the condition is deemed to be a musculoskeletal issue, the osteopath will help the person understand what is happening under the skin." Dr Funder says, "It is so important to get a good health team on your side, which may comprise a GP, Psychologist, Osteopath or Exercise Physiologist. Once you have a health team you can trust, you will be helping yourself to reduce your pain experience." "A good medical practitioner will take a thorough history and listen to the symptoms you are experiencing, they will assess you and make the best clinical judgement for a treatment plan or if further tests or a referral is required. You can consult with your local GP and visit www.osteopathy.org.au for more information," says Dr Funder. Question: Can you tell us about your pain? Sarah: It is already exhausting having two young children and then I have the added back pain, on top. It really upsets me to not be able to enjoy time with my children, I am unable to lift them up or get on the ground to roll around, with them. It's very upsetting and frustrating. I've had different types of back pain both middle or lower back most of my adult life but when I fell pregnant the first time, my back pain increased and I was looking for another option. During the birth of my first child I injured my coccyx through the delivery; after that my lower back pain got a lot worse. Any pressure on my sacrum or pelvis was really painful, debilitating. Question: How did this affect you on a daily basis? Sarah: I wasn't able to sit on the ground with my child, I wasn't able to breastfeed sitting up, and carrying him was too much pressure on my lower back. It was really frustrating, really upsetting because everybody else could do it and I wasn't able to. I would have to sit in the chair with my child on the ground at mothers group, or I'd have to have him in the pram, so it was really quite frustrating not to be able to give him that sort of close care that I wanted to. Question: How did you manage your chronic pain? Sarah: Firstly, I sought treatment from Physiotherapy. I also sought Chiropractic advice as well and I even saw a coccyx specialist to try and find out what my options were. I didn't know much about Osteopathy, at all, and I had spoken to a couple people at work that were seeking treatment through Osteopathy as well. I looked on the Internet for different articles around pelvic pain and it seemed that osteopathy might be able to help me. Question: What message do you want to spread during National Osteopathy Awareness Week? 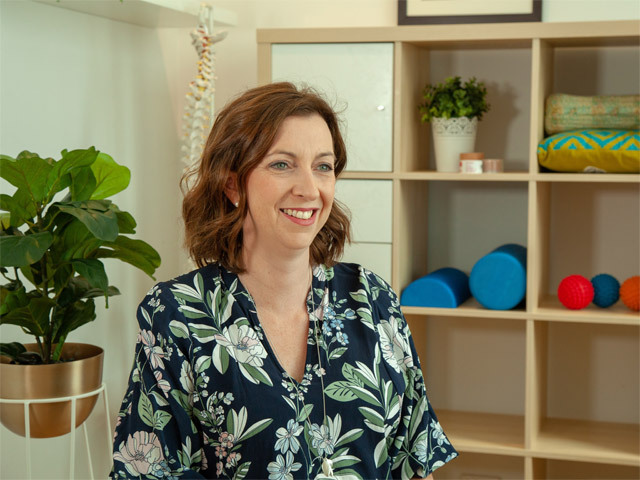 Sarah: Osteopathy has helped me live a more active life, enjoying more time and my kids, being able to do more leisure activities, and just more generally as I am not spending so much time focused on the pain that I've been in enduring for years. If anyone I knew was experiencing back pain or chronic pain I would encourage them to give an Osteopathy a go, it has really helped me I believe it's even changed my life. Question: How can Australians help understand chronic pain? Sarah: Osteopathy has given me the strength and confidence to be able to enjoy my life a lot more. I not only got treatment, but also exercises that I could do in my own home so that when I was around my kids or at times I couldn't get out to seek treatment I could at least be working on the pain in my own home.